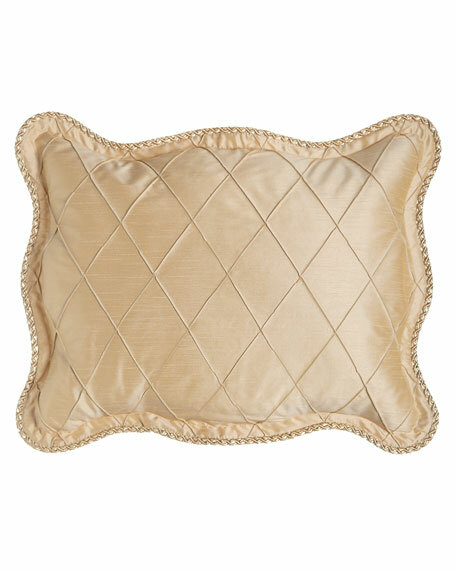 Diamond pintuck sham with corded scallop edge. By Austin Horn Classics. Shams with chenille flowers and cord trim are polyester/cotton with cotton/acetate moire backing. Dry clean . By Austin Horn Classics. Shams with chenille flowers and cord trim are polyester/cotton with cotton/acetate moire backing. Dry clean . Made in the USA of imported and domestic fabrics. EXCLUSIVELY AT NEIMAN MARCUS Made of polyester/rayon with marble swirl pattern. Cotton/polyester back. Corded flange edge. 19" x 35". Dry clean. Made in the USA of imported materials. Sham made of washed cotton/viscose velvet in neutral hues of champagne and ivory. Machine wash. Paris velvet shams have an applique design. 20" x 36". Imported. King sham with embroidered scallops. 350-thread-count white cotton percale. Optional 3-initial circle-script monogram. 21" x 36". Machine wash. Made in the USA of imported materials. Personalized/monogrammed orders cannot be canceled or returned. The monogram preview feature displays fabric color (not pattern), thread color, monogram style, and selected initials.